President and Chief Technology Officer for Peraton. Students listen to Dr. Brothers as he discussed artificial intelligence and how it can be both helpful and harmful for our society. He provided our scholars with several examples including some hands on projects about engineering and how it is related to artificial intelligence. Dr. Brothers answered several questions from our scholars and encouraged them to think about careers in STEM through motivational quotes from Bruce Lee. 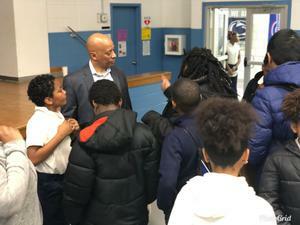 Out STEM club members were excited to introduce Dr. Brothers and discuss his presentation with him afterwards!